Is there such a thing as cheap solar power? It's a staggering fact: enough solar energy falls on the earth in an hour to supply the needs of the whole earth for about a year. However, of course it's not that simple - clearly we cannot catch all the sun's rays. Cheap solar power is a little more complicated than that. There are dozens of technologies now available which can claim to be solar; if you wanted to be strictly accurate, almost all farming is based on solar power - through photosynthesis. In fact, our whole lives are run on solar power - from the food we eat to the fuel we use and the clothes we wear. The energy all comes ultimately from the sun. Not so much cheap solar power - more like free solar power! But of course this wonderful source has to be harnessed and that costs money. Cheap solar power: What's here? Is cheap solar power possible? How green is solar power? Can it really save me some money? What different kinds of solar power are out there? Do all kinds of solar power system deliver cheap energy? This page is mainly about cheap solar power in the shape of solar thermal systems - they generate cheap hot water. Here's a look at what (relatively) cheap solar thermal systems are, what they cost and how and when they might save you money. Cheap solar power is definitely possible - though not always so easy to achieve! Recent technologies for cheap solar power include such things as solar ovens for cooking, "daylighting" (the design of window placement to achieve maximum day light which of course saves on artificial light) and passive solar designs for buildings - which enable them to warm up and cool down with very little energy input. All these techniques can deliver cheap solar power for the home, to some extent. But the main types of solar power available to most of us - those who are not building new houses or retro-fitting old ones - are solar thermal and photovoltaics. solar electricity generation through photovoltaic cells (PV). This page is about solar heat, which of all the solar energy options, probably has the best claim to provide cheap solar power. Solar heat systems use the heating power of the sun to warm water. The water is then used to provide domestic hot water. It's used for all the usual reasons you use hot water - washing dishes, cleaning, bathing and laundry. The hot water collected is not generally used to heat the home. This is because the amounts generated in winter time are not usually enough to adequately warm a house. However, even in winter in quite chilly or dull areas there is sufficient warmth to make a difference to domestic hot water. In the UK, for example, anyone with a south facing roof should be able to heat almost all their hot water from solar power during summer months. In winter about 40% heating is usually achieved. Overall, in the Britain, we can expect to get about 70% of our hot water from a decent solar thermal system if we live in the sunnier south. Water temperatures of around 60 degrees C can be achieved routinely - which is enough for most people's needs, especially if copiously supplied. Government grants are available to help with installation costs. In the USA, people can expect to save around $6 per person on hot water heating. A typical pay back period is 9 years and there are government grants available towards installation costs. Thermal solar heating has taken off in a number of countries. China leads the way in terms of the sheer quantity of heat generated and countries such as Israel and Cyprus have up to 90% of homes using solar thermal. In the US and Australia solar thermal energy is a popular way of heating outdoor pools. There are many different systems which can deliver domestic solar water heating. They are generally of two types - active and passive. The one that mainly concerns us here is the active kind. Active solar thermal systems use a pump to make the heat move around from the point of capture. Some modern systems integrate a PV (photovoltaic) electric pump into the system. This means that the pump also runs on sunlight. The solar heat is collected by special solar panels which concentrate the sun's heat as it falls on them. The heated water is sent from the place where it is heated (usually, but not always, the roof) through pipework until it arrives in the hot water cylinder ready for distribution. There are vented and unvented systems. Most modern systems are unvented with a controller and sensors to maintain the flow. These are generally better because they can be used with mains pressure water. Vented systems use a the header tank to supply the water in the system and gravity is what causes the hot water to be distributed. The water cylinder in modern solar hot water systems is heavily insulated against heat loss. If the water is already hot enough, then linked thermostats and valves direct the water from the tank or cylinder to the point of use. If the water is below the required temperature then the pre-heated water (that the sun supplied) goes from the cylinder to the boiler for heating to the required temperature. Usually a special cylinder or hot water tank is used which has two coils. One transmits the heat from the heated water to the water in the tank. The other is for the electric or other back up. When there is not enough sun power available to get your water hot enough, then the fuel source (electric, gas, oil, compressed wood etc) kicks in so that the water is heated to the required temperature. The oldest types of solar hot water systems rely upon gravity and the opening of taps to move the hot water. Such "batch" systems are relatively simple and can be made by anyone who loves DIY. Most people will want a more sophisticated approach. If you live in an area where frost is common, you may need a system in which glycol is used instead of plain water. The glycol circulates in the system without any danger of freezing up. The coil inside the water cylinder carries the glycol through the cylinder where it gives up its heat to the water. You need an electric pump to make the heated glycol move around the system and give up its heat to the water in the cylinder. There are some systems available which have an integrated pump run from solar photovoltaic cells. Such systems generate no carbon emissions except for those generated during manufacture of the components. There are home made solutions using coils of black plastic tubing. These are really very cheap to install and may suit some people who are good at DIY and only want a very basic system. You can also buy more sophisticated systems to fit yourself. These solar kits are for the experienced DIY enthusiast as they are quite expensive (typically around half of a fully-installed professional system). For most of us the best option is a professional solar installation. These are not especially cheap and sad to say, as is common with new technology, there are plenty of cowboy outfits jumping on the bandwagon. It pays anyone wanting solar thermal water heating to do their due diligence with whoever they pick to do the work. Many large scale outfits are also now getting involved. For example in the UK, British Gas, one of our largest energy suppliers, is now offers solar heating. Companies such as them will doubtless offer a highly professional service, with costs to match. Small companies often offer a cheaper and more competitive service but quality will be more variable. 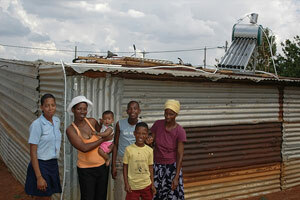 What do you need for a solar powered system for your hot water? and a special cylinder for storing the hot water. Solar panels are of two main types: flat plate systems and evacuated tube systems. The latter are the more efficient but in my view they don't look so great. Flat plate solar panels look almost like a tinted window sitting on your roof whereas evacuated tubes look like some kind of radiator grill. Evacuated tube solar panels also tend to be more expensive. Are evacuated tubes worth the extra money? If space on your roof is at a premium it might be worth considering evacuated tubes. They are more efficient for the space used - around 10% more. If you have space it is probably cheaper to just buy an extra panel and have a bit more of your roof covered. Evacuated tubes perform better in cloudy weather, so they may be worth the extra cost in cool, cloudy countries such as Britain and Ireland. What will a solar heating system cost? In the UK today you can expect to pay around £3000 to £5000 for an installed solar system. Savings on your fuel bills may be exaggerated by some companies. With rising fuel bills you may find that you get a pay back time of under a decade but if prices stay down, you might take 10 or 15 years for the system to recoup your costs. Some might think this is not quite cheap solar power! Certainly, most people will want to think hard before opting for solar thermal heating. The UK government reckons that you will save around £65 on fuel bills if you install solar heating. Actual users report saving as much as £400 a year. As you'd expect, how much you save depends upon the current system you use and the size of your house. If you have solar water heating, it is important to remember to adjust your thermostat constantly throughout the year so that you get both adequate hot water and optimum fuel saving. That's one way to get relatively cheap solar power. If you want an even cheaper way to get solar thermal heat for your hot water tank there are DIY kits and low budget options to consider. DIY Solar Power for Hot Water gives some simple ideas for installing a rudimentary system for solar hot water. If you have yet to insulate your loft, this is probably the single most cost-effective thing you can do to cut your energy bills. Please see the other Energy pages on Greenfootsteps for more ideas. There are also several articles on cutting energy usage in the Frugal Living section.